Having lived in the coastal rainforest most of my life I should probably have learned more about mushrooms by now. Alas, I am woefully ignorant. While at the ISPT tracking conference some of us noticed an abundance of mushrooms that had been coming up in the lawns and woods around Carnation. A couple of them were unlike ones I'd ever seen before. I don't have a picture of it, but one mushroom was found that looked like pasta that had been cooked a little too long then allowed to cool in a clump. 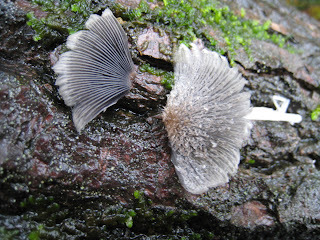 Another new one for me is this fuzzy one which I found growing under a log. Unfortunately it broke off as I tried to get a better picture of it. 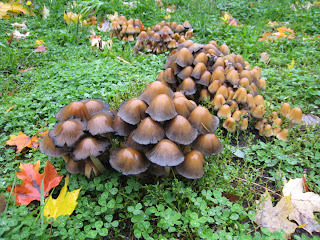 I think these might be called inky caps. I like the little colonies they form. This is an observation from several moths ago. The pictures have been sitting on my camera waiting for me to do something with them. I was sitting in my apartment (where I no longer live) and noticed a dark spot moving up the wall in the corner near my door. Upon closer inspection it turned out to be a beetle (or at least something that looked like a beetle to my relatively untrained eyes), about a centimeter long, climbing the wall. I continued to work, but occasionally glanced over to monitor its progress. After it had attained a height of around four feet it plummeted to the ground. I heard a little *click* as it bounced off the floor. After a little while I went over to investigate and what I found was a little surprising. The beetle was suspended an inch or two off the ground in a light spider web and the little spider (probably not even a third of the mass of the beetle) was wrapping it up, its legs still moving a bit. Slowly, even as it was wrapping it further, the spider moved the beetle to a more secure part of its web several inches away. I had mixed feelings as I watched the beetle struggle. It seemed like I had some little connection with it after watching it climb the wall. But the spider needed to eat and I didn't have any idea how injured the beetle was or what it was trying to do anyway. I figured this was a pretty ambitious catch for such a small spider, that such a meal probably didn't come along too often. But when I got in closer to document the event a little better I discovered the spent corpses of two other of what appeared to be the same sort of beetle. Had this little drama played out the same way twice before? If so, what were the beetles drawn to? And where had they come from anyway? 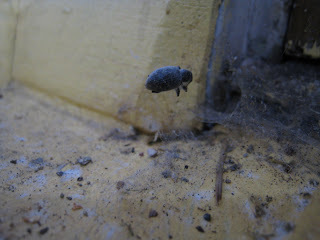 If it happened differently, how had such a small spider managed to wrangle in so many large beetles? The other hapless victims. 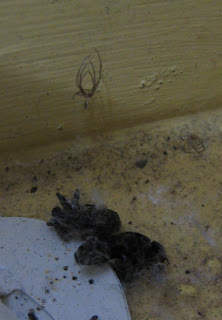 I think the spider husks seen here give a good approximation of the size the spider was.